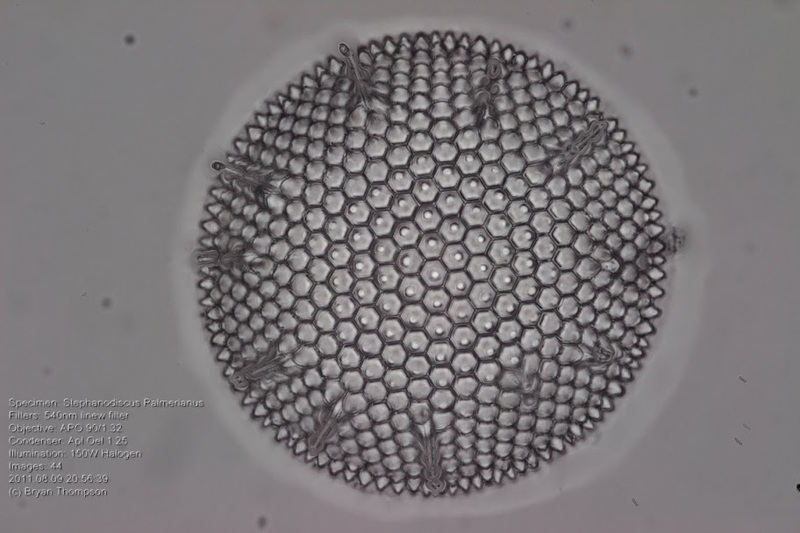 Hello, I have been experimenting with stacking images of diatoms. I recently acquired a stepper motor so I could try out deeper stacks and see if I could produce good visualizations of "thicker" specimens. I chose the attached specimen because it has a lot of "depth" to it. The main part of the frustule has come out modestly well in this stack. However, the spikes projecting nearly vertically from the surface have significant stacking artifacts. I was wondering if anyone could suggest what I might do to minimize these artifacts. If you look at the spikes you can see that the spikes have significant "waves" in them. If you consider the frustule as the face of a clock, the problem is more severe between 1-o'clock and 5-o'clock. I freely admit that this is a challenging specimen. The relief of the main body of the frustule changes more slowly than the spikes, but there are a fairly large number of images which "slice" the spike region in the source stack. I have tried to adjust the radius and smoothing parameters. Reducing the radius from the default significantly degrades the image. Changing the smoothly does not appear to help either. I would suggest to disable Autoadustment for magnification first and maybe even for shifts. I suspect that the program distorts the image when aligning images when they are very out of focus. Anyway, it is worth checking. If you upload your stack to our ftp server (as described at http://www.heliconsoft.com/ftp.html) we will test it ourself. The only difference between JPEG and RAW files is higher color depth (8 bits vs 16 bits) which allows RAW files to render dark areas much better. In most cases you will not see any difference at all. To tell the truth, I have no good suggestion for you. It looks like bokeh produces kind of ringing effect arount contrast areas. And these "rings" are then stacked by our program. Please make sure that your camera does not make any sharpening. I meant that maybe ringing effect was caused by specific form of bokeh produced by your lens.